Perkins (left) and her field site partner, Mackenzie Aime (right). No person should have to go hungry. That’s what Lakeisha Perkins (’18 agriculture and society) believes—and she has now dedicated her career to fighting against hunger and poverty. Perkins always knew Iowa State University was the college for her, but when she first arrived on campus, she believed she wanted to be a veterinarian rather than work to end food insecurity. “I chose Iowa State University for their incredible animal science program and although this was not the right major for me, I stayed at Iowa State University because it felt like home.” Upon learning about the agriculture and society major while working as a Cyclone Aide, she became interested in changing her major. Perkins found that she was able to truly own her education in her new major. “What was most special for me majoring in agriculture and society, was that it felt like my major was designed by me and for me. There was a lot of flexibility in choosing classes I would be interested in and that related to my career goals,” Perkins said. Growing up in Des Moines, Iowa, Perkins learned firsthand what it is like to deal with stigmatized problems such as homelessness, racism and poverty—those experiences fueled her passion for her new major and helped her set new goals. “I am a biracial woman who was born into a poor family. My family has lived in shelters and churches, which is something very few people know about me,” said Perkins, “We have faced food insecurity and I understand how living this way can limit your opportunities and negatively influence a person’s life. My firsthand experiences, combined with my education, has convinced me that I need to work to challenge stereotypes about hunger, food insecurity and poverty and help address these issues. Though she felt like she had a home at Iowa State and as an agriculture and society major, it still was not an easy path. Through support systems like the Multicultural Vision Program and working closely with faculty members, Perkins was able to find the support she needed to stay in school and be successful. With all of the support she received, she was able to truly excel, and prior to graduation in May 2018, Perkins won the Commitment to Diversity Senior Award. As of August 2018, Perkins began her journey as part of the 25th Class of Bill Emerson National Hunger Fellows. 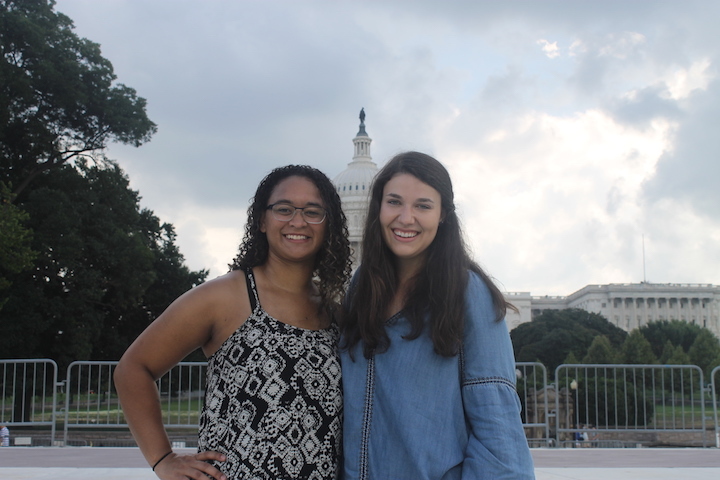 The prestigious, competitive fellowship includes training in Washington, D.C. on issues surrounding poverty, hunger and racism. After their training, fellows such as Perkins travel to field sites all over the country to work in communities to find solutions to hunger and poverty. Perkins is one of 19 fellows who was selected from more than 400 applicants. She attributes her preparedness for her fellowship to her education.